You are here: Home › Reviews › Will the first sub 2 hour marathon be run barefoot? 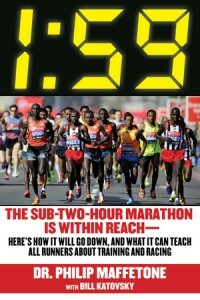 That is the claim in a new book; 1:59 The Sub-Two-Hour Marathon is Within Reach – Here’s how it will go down and what it can teach all runners about training and racing by Philip Maffetone. I have long had an interest in this and followed many stories and speculation on when and how it would happen, so eagerly got a copy of this book. The current world record is 2:03:23 by Wilson Kipsang, who ran it in shoes. You can see the progression of the world record at Wikipedia, where the fastest barefoot marathon is 2:15:16.2 (by Abebe Bikala in 1960). The book goes through chapters on running economy, training, muscle balance, feet, nutrition, altitude training and the brain and looks at what it claims would be needed to break that two hour marathon. Its just the factual errors in the book; the inability to properly understand and appraise the research; the promise of the ‘second coming of the messiah‘; the belief in the ‘one size fits all‘ when it comes to the best way to run; and of course, the misuse, misrepresentation, misquoting and misinterpretation of the science. I do not necessarily have the expertise to review the entire book, but I do have the expertise to review the chapter on the foot and running shoes and I think it falls way short of the mark. While I enjoyed reading the other chapters of the book in which I have no expertise, there was always that doubt in the back of my mind about the claims being made. Based on my experience of the foot and running shoe chapter, it was hard to know. The chapter on the foot and running shoes is riddled with cherry picking and the use of the wishful thinking fallacy – that is just making a statement and wishing it was true. Those who are not familiar with the use of this fallacy and the body of literature surrounding the topic will have no reason to doubt that the claim being made may not be true; they just believe it. There is also a lot of use of the ‘appeal to authority’ fallacy – that is the citing of authorities with no appraisal if the statement made is correct or not. Just because an authority person makes a statement does not make it true or not. When a runners foot properly hits the ground impact energy is first stored in the muscles and tendons. Right away, 95% of the energy is then used to helps bring the body forward like a pogo stick. This mechanism provides about half the energy required for leg- and foot- muscle propulsion with the other half coming from sugar and fat metabolism. Right away those figures of 95% and 50% are made up and based on nothing! Yes, the energy return is an important part of the running gait, but if you going to make statements like that (which I acknowledge is the current dogma), you are going to need to cite your sources. You are also going to need to explain why the most recent research suggests its actually as low as 2%. However, I do acknowledge that this new data is scant on details (see this discussion). You just can’t ignore or dismiss research that does not support your dogma or world view. That research is not going away. The odds of a 1:59 Marathon are stacked in favor of a shoe less runner will. That is the wishful thinking fallacy at its best. Nothing is provided to support that except for some anecdotes and quotes and stories (eg the Abebe Bikila one). Some science is misused, misrepresented, misquoted and misinterpreted to support that proposition. Research saying the opposite is ignored. Unless you are familiar with that body of research you would not know that and fall for it. If you are going to make statements like that, you are going to have to address the issue of, for example, the research that has shown cushioned shoes are more economical than barefoot. You can’t ignore it as its not going away. And so it is for many statements made in the foot and running shoe chapter. I have no idea if it is the same for other chapters as I do not have the expertise in the body of literature on those topics. I have reached out to some other running science bloggers suggesting that they might want to review the book. So, will the first sub 2 hour marathon be run barefoot? At last months International Running Symposium in Calgary, Ned Frederick addressed the issue of a sub 2-hour marathon in his presentation and suggested it will done in a cushioned shoe. So who is right? Ned Frederick or Philip Maffetone? There is evidence that running in a cushioned running shoe is more economical than barefoot, so there is some evidence on Ned’s side. On the other side, there is the dogma (that is probably correct), that each 100g of shoe weight adds 1% to the energy cost, so that is some evidence supporting Philip’s side. Two things that Ned did point out in his presentation was that materials are getting so much lighter and if you look closely at the data in the studies showing cushioned running shoes are more economical was that the responses were subject specific. This means that the amount of cushioning would probably need to be tuned specifically to the individual runner to get the best economy for that runner. As always: I go where the evidence takes me until convinced otherwise … and my use of the wishful thinking fallacy based on an extrapolation of the evidence is that the first sub two hour marathon will be run in a very lightweight cushioned running shoe, with the amount of cushioning specifically tuned to the that runner to give them the best economy. I got my copy from Amazon.com; its also available from Amazon.uk and Amazon.ca; in Australia, Fishpond have it. 5 Responses to Will the first sub 2 hour marathon be run barefoot? theory on footwear seems to be in line with his paleo approach to diet and exercise. Interesting stuff! Most of his theories are pseudoscientifc nonsense. 1. Cherry pick the scientific research which is only favorable to your myopic point of view. 2. Glorify those that agree with you. 3. Bash those that don’t agree with you. 4. Sell your views by publishing a book and teaching courses as long as starry-eyed gullible people continue to listen and believe your bizarre, ill-informed ideas based not on science, but on religious fervor. We can speculate all day, but will never really know until somebody makes it worthwhile for an East African to train for and attempt a WR or sub 2hr while barefoot. I don’t think the improvement on Bikila’s 1960 WR has been that drastic given the changes in training, nutrition, PEDs, and shoes. It would be nice to see a serious attempt before dismissing the possibility. I’ve never heard of the book but thanks for an interesting topic.